Background: Flavin mononucleotide (FMN) specific riboswitch, also known as RFN element is frequently found in prokaryotes and also in some eukaryotes. FMN riboswitch is directly involved in the expression of Rib DEAHT genes in the biosynthesis and transport of riboflavin (vitamin B2). In case of bacteria all the genes of Rib operon are involved and the RFN element is found in a number of species where as in eukaryotes only one or two genes of the Rib operon are involved. Objective: In this study we have searched the FMN riboswitch in different phyla and compared them at the structural level. Method: The riboswitch finders RibEx and Infernal are used to predict the FMN riboswitch from the sequences aligned to known sequences from two bacteria. The putative sequences are tallied with Rfam database and LocARNA web server and RNAstructure tool are used to find the secondary structures. ModeRNA is used to find the tertiary structure, which is compared to a known structure from PDB by using ARTS server. Autodock Vina is used to probe the binding of the ligand FMN to the aptamer of the riboswitch. Results and Conclusions: Amongst eukaryotes, very few instances of FMN riboswitch have been identified in plants and only one putative FMN riboswitch has been found among fungi. In case of archaea, FMN is found only in two species of Euryarchaeota. The crystallographic structure of FMN riboswitch is well established with six stem junctions in Fusobacterium nucleatum. In this study we find that the aptamer sequence of the FMN riboswitch is six stem loop structure that is P1, P2, P3, P4, P5, P6 and confirm that the FMN ligand is bound in this six stem loop junction. The aptameric region on the basis of sequence as well as structure is conserved in all the Bacterial, Archaeal, Fungal and Plant species studied. The tertiary structure of the FMN riboswitch is predicted in Bacillus thuringiensis, Methanobrevibacter smithii, Cannabis sativa and Epichloe glyceriae and it is compared with the well known structure of Fusobacterium nucleatum. Keywords: Riboswitch, secondary structure, aptamer, mRNA, gene regulation, minimum free energy. Keywords:Riboswitch, secondary structure, aptamer, mRNA, gene regulation, minimum free energy. 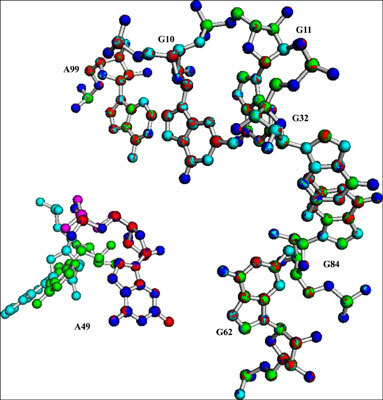 Abstract:Background: Flavin mononucleotide (FMN) specific riboswitch, also known as RFN element is frequently found in prokaryotes and also in some eukaryotes. FMN riboswitch is directly involved in the expression of Rib DEAHT genes in the biosynthesis and transport of riboflavin (vitamin B2). In case of bacteria all the genes of Rib operon are involved and the RFN element is found in a number of species where as in eukaryotes only one or two genes of the Rib operon are involved.